I love Palm Sunday. Our church has the children from the nursery bring palm fronds down the aisle at the start of the service every year for Palm Sunday and it’s always such a special reminder of the day of Jesus’ triumphal entry in to Jerusalem. Such a bittersweet day–because Jesus knew that although on this day they hailed Him as King, in less than a week, He’d be giving up His life as payment for our sins. And yet, I still want to say, “Hosanna!” Because the alternative–had Jesus not chosen to come and to die–are so terrible they’re not worth imagining. I hope that as you enter Holy Week your heart and mind are fixed on Jesus and the sacrifice He made on our behalf on the cross. And I hope that if Jesus’ death and resurrection isn’t something that has a personal meaning to you that you’ll reach out to someone and ask them about the salvation that comes only through accepting Jesus death on the cross as payment for your sin. Alexa Verde’s winner from the 4th is lraines! Don’t forget that every comment on a post each month enters you into a drawing for one of our two monthly Amazon gift card giveaways! Saturday, Sally Bradley told us about a new-to-her author. Happy Palm Sunday! Palm Fronds are handed out at our church each Palm Sunday at our church at the beginning of service. I enjoy seeing the origami like creations evolve during the service. My favorite is cross with the woven center. Have a wonderful day everyone. My sister just sent me a diagram showing how to make those palm crosses. They really are lovely. Happy Palm Sunday! Blessings to All! 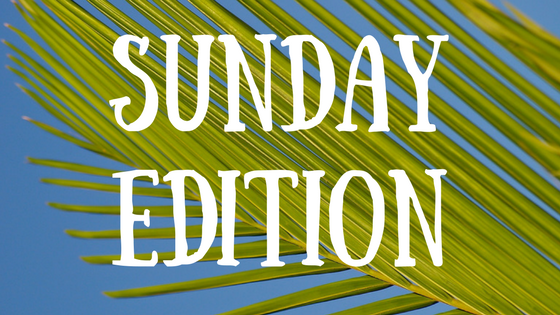 Happy Palm Sunday to all! I have one Palm Sunday memory that stands out. We were sharing about our missionary service at a church in southern Calif. They’d arranged to have a small donkey walk in with the kids and their palm branches. Well, that part of the service went on a bit too long, and he relieved himself (liquid) right in front of the platform! I can’t believe it’s almost Easter again! Where has the time gone?? Looking forward to catching back up with everyone, blessings!! I’m right there with you wondering where my year is going! We have the same tradition at our church on Palm Sunday. Holy Week is a reminder to cleanse our souls and strengthen our faith. Thank you for a great post, Elizabeth! I loved reading it.